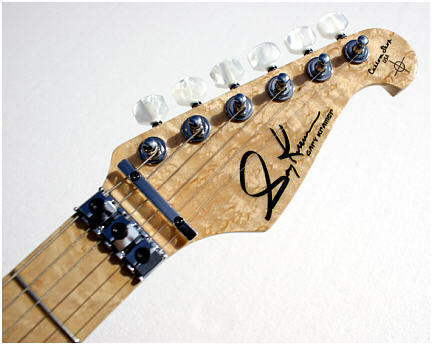 Gary Kramer Guitar has released a new line of super strat based guitars known as the Cathedral Series. 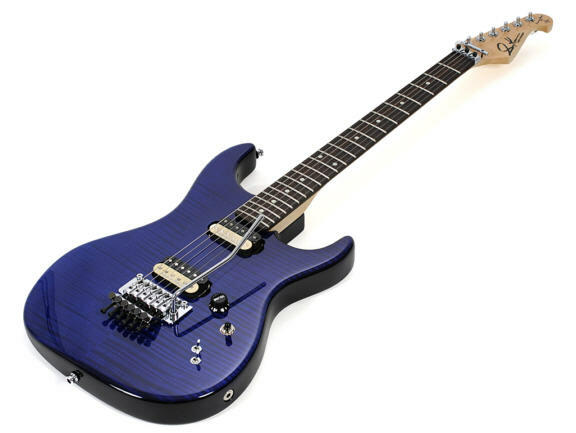 While best known for the innovative Delta Wing Design, the Cathedral line has been designed with the more traditional player in mind, who wants all the features of a high end instrument, with the familiar feel of a shredders type guitar, complete with a double-locking Gotoh (Floyd Rose licensed) tremolo and hot pickups. While there are many manufacturers producing guitars of the same variety, it should be noted that GKG really went a step beyond by making a custom instrument that has the best of "all" worlds, combining features from many manufacturers into one custom shop instrument. The overall body shape has similiar characteristics to that of a vintage Kramer from back in the day. However, the round over on the edges isn't quite as drastic, so it is almost a blend of a Jackson style body with the old Kramer shapes. It is definitely unique, with the review model consisting of a maple laminate top, on a mahogany base. The cherry burst finish is exquisite, there are zero flaws and the color just sings under stage lights. 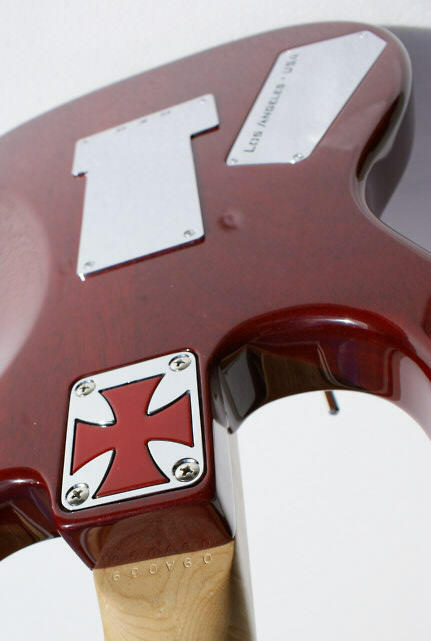 Some additional features include a recessed input jack, along with a recessed cross neck plate, and some very cool aluminum cavity covers, etched with Los Angeles, USA on the back. There is no doubting whether or not this guitar was made in USA, as it is branded consistently on the guitar and in addition to the brochures and pamphlets that were included in the case. 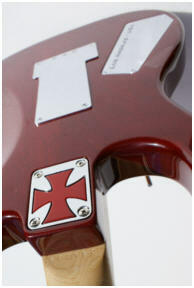 The cross is extremely cool as well, keeping with the Gothic theme of the branded Crusader/Cathedral mantra. I personally like the custom shop feel of the serial number stamped into the wood at the base of the neck, in addition to the small creature comforts in the design over all that lend this guitar to being above and beyond a production instrument. The neck is just amazing, with three dimensional wood running up and down the back of the neck and fingerboard. Make no mistake, this is one beautiful guitar. So many manufacturers loose the one feature every player desires the most; the ease of playability in an instrument. Setup is so very important in addition to how the players hand reacts to the back shape, and overall finish of the neck. The frets play a huge role, and additionally the spring tension of the bridge for "slinkiness" of the strings. Gary Kramer has taken all of these factors into account, - the Cathedral can be taken straight out of the case from the factory and right to the stage, with zero adjustments needed. Leo has done an amazing job with setup, fret dress, bridge setup, intonation, all the factors that have to be there in order for your guitar to become that old friend within a gig or two. Playing the Cathedral is effortless, I literally took the guitar from the case after doing a quick tune (after being received in the mail) and it went straight to a gig. Instantly, I noticed all the details mentioned in the prior paragraph, the bends were extremely easy, the frets were so well dressed that the strings felt like they were on a slip and slide, it was just so easy to play and felt like an old friend on the first gig. The frets are huge, they are perfect for cowboy chording or doing your favorite solo for those guitar heroes out there. The bends were also effortless as the Gotoh Floyd Rose was setup perfectly. The gunstock oil and wax blend on the back of the neck is a welcomed feature as well. Finished necks feel sticky, I've never understood why more manufacturers don't offer oiled necks by default. Luckily this trend is starting to take hold with other companies. The Cathedral is no exception, it's super fast up and down the neck, and feels "broke in" from the start. Most Floyd Rose purists will ask "Why a Gotoh?". What I always respond back with on our Kramer Forum is "Why not Gotoh?". 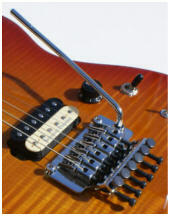 Gotoh's are very nice alternatives to a real Floyd Rose - in fact probably the best alternative. Additionally, it's far superior to the overseas Asian Floyd Rose that has been recently put onto the market. If Gotoh's were good enough for Eddie Van Halen back in the Ernie Ball years, then to me, they've been road tested by a professional and can be relied upon just as much as any real Floyd Rose. The saddles have nice round- overs, for guys like me who rest their hand on the bridge while playing. And in this authors opinion, I think Gotoh's have better sustain than OFR's. Maybe that's just my observation, but after playing my Ernie Ball's live in addition to this guitar, the Gotoh seems to have better sustain, and better resonance. My only complaint upon receiving the Cathedral is that the bar adjustment was too high, so I had to adjust the bridge to get the bar "lower" into the arm hole. Say what you will "recessed tremolo" players - the blocked, sitting flat on the body, Gotoh, is essential to the Cathedral's tone. I'm glad Leo/Gary realized the importance of a flat mount Floyd as tonally they are far superior. Yes, for you pull back guys, you won't be able to do that, but hey, did EVH ever worry about pulling back? Gary Kramer kept with tradition on the pickups, installing Seymour Duncans by default from the factory. A JB is featured in the bridge position with a Jazz at the neck. Lately I've been a little disappointed with JB's in other guitars when playing at loud volumes. JB's tend to have a massive amount of midrange, which can sometimes get "honky" during a performance in rhythms. With the Cathedral - this is not the case at all. The JB mixed with the Mahogany is just an awesome combination - a combo I've never tried before in any of my other guitars. it's got bite, and it's got balls, the tone hits you square in the chest at loud volumes. it's punchy, it cuts through the mix, and it reacts perfectly for your string attack. The neck pickup is perfectly balanced with the bridge, it's perfect for the middle switch position, when you want some bite, but with some bluesy mixed in for classic rock. Then if you dedicate the neck pickup, you get those sweet, buttery leads we are all so familiar with in vintage instruments. I also like the direct mount on the pickups to the body. I do like the added parallel/series switches for both pickups. You can hear some subtle changes in the tone when engaging/disengaging. This is probably the only feature on the guitar I found that was not quite what I expected. I wish those switches were coil taps, to split the coils on each pickup to engage them into single coil mode, as opposed to series/parallel wiring. Some may prefer the stock setup of these switches, I would just prefer they were splits. The volume knob is very nice as well with the rubber grip attached. This is another thing most manufacturers miss out on - finding a GOOD volume pot that rolls off quickly and easily with your pinky. Gary and Leo chose the perfect one, it's very easily rolled off/on during songs, it doesn't take a pair of pliers to turn the volume down. Other manufacturers should take note of simple features like this. A guitar can look pretty all day long, but if it doesn't serve it's purpose, then it's a failure. If a guitarist can't rely on a guitar to be the number 1, or to be the one you're grabbing when you're feeling nervous, then it's a failure. The GKG Cathedral is not only gorgeous, but it is the only guitar you need in your arsenal - don't buy it for its looks - buy it because it serves its function well. The first gig with this guitar, I didn't want to put it down. Sometimes you take a guitar out for the first time, and you feel like "ok, this isn't happening, I need to go back to the old friend" - that did not happen. I even brought along my beloved Pacer Reissue - I love that guitar and I couldn't bring myself to put down the Cathedral. It was effortless to play. The crowd even commented that one of my solos tonally punched like they had never heard before. I could feel it as well, the way it reacted to my amp, my effects, everything, it was a perfect experience. 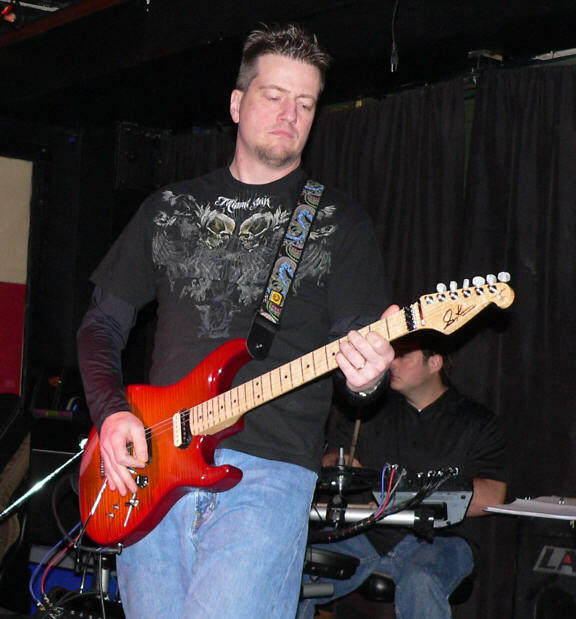 Any time I had to switch to the neck pickup, there was no volume difference. The options I had while playing different cover songs with the simpleness of just three pickup switch options, it was like I had 1000 things to choose from. That's all you can ever ask for when you play a guitar, either on the edge of your bed, in your office, or in a gig - does it perform its duty. I would love to hear one of these out live with a larger band, just to see if it has that same vibe as what I've experienced. How does it compare? Many will say, "For $2799, it damn well better perform". Lets be clear on the pricing and the positioning of this guitar among others in the same category. Yes, it is expensive comparatively to say a Kramer Pacer Reissue, or a San Dimas Socal Charvel, guitars that are awesome in the under $1200 category. However, this is a true custom shop instrument, with custom shop features such as a flame maple cap, 5A birds eye on the neck, and a finish that is just remarkable. Compare this to a Les Paul with similar features. 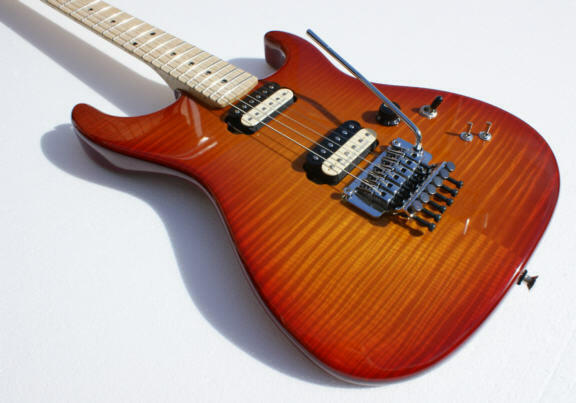 Compare this to an Ernie Ball Axis, Charvel Custom Shop, EVH Wolfgang, Suhr, Tom Anderson- guitars that are priced higher but ready to go out of the case. Let's not forget this is a 100% custom made instrument right here in the USA as well. Gary probably won't sell 100,000 of these guitars, and that's not the intent. 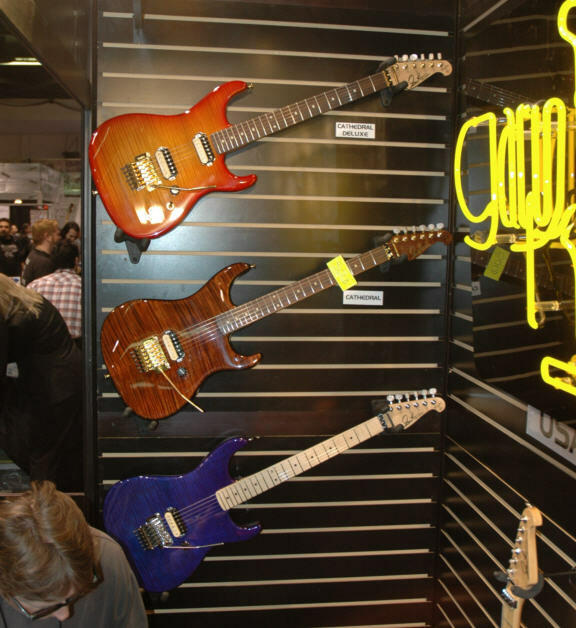 The intent is to make a high quality instrument that can be custom ordered if desired to the specs the player wants. If someone wanted to know what this guitar was all about, I'd say, it is a hybrid original. The neck feels something like a cross between a vintage Kramer beak, blended with a Charvel San Dimas. The back shape is definitely Pacer-like, while the fretboard and frets feel more Charvel. The neck finish feels like an Ernie Ball, and the playability resembles one of my Ernie Balls. The pickups are mounted direct - an Ernie Ball feature. The shape is old school Kramer, blended with modern Jackson/Charvel. It is original, yet, it incorporates those features in other brands that I love so much. Its as if Gary and Leo grabbed my three favorite guitars and pulled the best features out of each. Do not lump this guitar in with the Vintage Kramer models or the modern Pacer Reissue - it is a different beast. I love my Pacer Reissue, I still play it just as much as I used to, but these are just two totally separate instruments. The GKG is not a Kramer, it is a GARY KRAMER GUITAR. So the question is, "Why should I buy this guitar over the 1000 other options I have within the guitar market?" Every player has the things they look for in an instrument. If you're looking for a guitar that features shredder qualities, with the tone of a vintage model, and switching options to provide a variety of tonal options, then this is the guitar for you. If you don't prefer a Floyd Rose trem, or if super Strats aren't your thing - then this is not the guitar for you. If you grew up loving the styles of Eddie Van Halen, George Lynch, Joe Satriani, Steve Vai - you'll love it. If you want a more affordable guitar, then this is not the guitar for you, remember, you get what you pay for in life. You're never disappointed by the best. One additional reviewers note - the case the review guitar shipped in was a Emu Skin wrapped G&G Case - Form fit. The case is as gorgeous as the guitar, in fact, so nice that I didn't want to take it to a gig. Here are some various photos of other Cathedrals and gigging pictures with the review guitar.